A dog collar is much more than a safety restraint for your little pooch, or a place to hang his or her nametag. In reality, a dog collar is an effective tool that helps provide for your puppy's safety while offering a sense of canine fashion too. Well-crafted dog collars can mimic both the breed and personality of your furry friend, and will add an extra sense of style to walks around the beach, hikes in the mountains, or even quick trips into the city. Do you need a dog collar for your pet that's durable and fits well. If so, don't hesitate to look through the collection of collars offered by EzyDog today. All the dog collars available from EzyDog are built to last and fit dogs of all shapes and sizes. Why Should You Consider a Dog Collar from EzyDog? When looking for a dog collar for your beloved pooch, it is important to keep in mind that this tool and fashion accessory will be part of your puppy's life for years to come. As such, you should bring home a dog collar that is stylish, durable, and a perfect match for both you and your dog. At EzyDog, we understand that dog collars constitute one of the most important items in a puppy life; in light of this, we only offer collars that we would trust with our very own furry friends. We are dog owners ourselves, and are committed to offering you quality dog collars that will last you and your puppy for years to come. What to Expect in a Dog Collar from EzyDog? A variety of different dog collars on the market today offer nothing but a simple restraint tool. In contrast, some dog collars are meant more as fashion devices, yet offer very little protection or safety, and certainly are not meant to last. The dog collars available from EzyDog, however, are crafted with a combination of factors in mind to ensure that all of your needs are met. Our dog collars offer a sense of simplicity and style, as well as a host of other additions to keep you and your dog happy. DURABLE – every one of the dog collars available through EzyDog is durable and built to last for years. RUST PROOF – afraid of your puppy's collar rusting after being caught in the rain? Our collars are completely waterproof and will stay rust-free regardless of the weather. COMFORTABLE – there won't be any rubbing at the neck with our collars, as each is designed with your dog's comfort in mind. STYLISH – for many dog owners, canine style is paramount. Because of this, all of our collars will keep your puppy looking sharp no matter where you go. EASY TO CLEAN – even the cleanest of canines will get dirty once in awhile. But while you may need to take your pooch to the groomers, these great collars can be washed in a matter of minutes. Are you looking for a great dog collar for your Bichon? Or do you need something that will fit your Great Dane? Regardless of size, make sure to consider one of the dog collars available online from EzyDog. 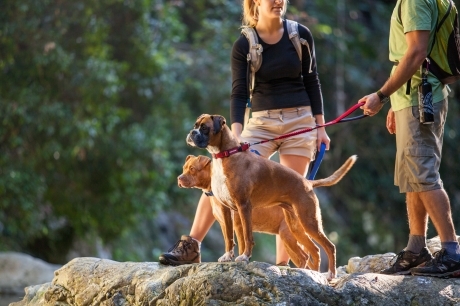 Neo Collar, if your dog is active and ready for adventure, the Neo Classic Collar may be the way to go. This restraint is made with neoprene, as used in wetsuits, which can withstand even the toughest of conditions. 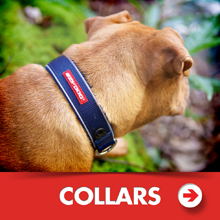 Neo Wide Collar, if you are looking for a neoprene collar for a dog with a slightly wider neck, the Neoprene Classic Collar Wide should fit your needs, a collar designed specifically designed for large and extra large dogs. Checkmate Collar, do you want a simple, reliable and secure collar to train your dog? The Checkmate Training Collar is the perfect option for you. 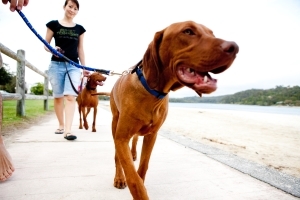 Double Up Collar, if your dog tends to pull on the dog leash during a walk, you may love the Double Up Collar, a restraint with twice the strength and security of traditional dog collars. Ultimately, at EzyDog, we have dog collars available for puppies and dogs of all sizes and with entirely different needs. If you are looking for a new collar, look no further than the collection available today through EzyDog.